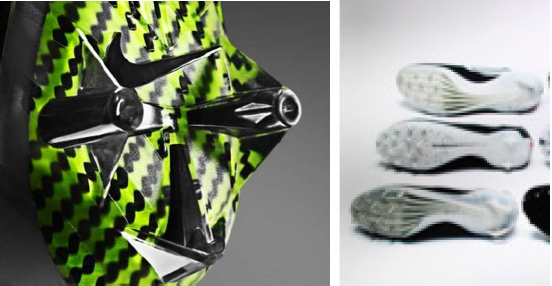 See more objects with the tag sports, accessories, lightweight, innovative, 3D printing, athletes. See more objects with the color darkgreen olivedrab palegoldenrod yellowgreen darkseagreen or see all the colors for this object. This is a shoe. It was designed by Nike Innovation Design Team and manufactured by Nike, Inc. (Beaverton, Oregon). This object is not part of the Cooper Hewitt's permanent collection. It was able to spend time at the museum on loan from Nike, Inc. (Beaverton, Oregon)	as part of Beautiful Users. It is dated 2014. Its medium is sole: selective laser-sintered polyamide (nylon). These football cleats are designed to help athletes accelerate laterally and quickly change direction. The tri-star studs enable the player to achieve maximum speed when running on turf while creating the optimal traction needed for rapid deceleration and agility. In this product, 3D printing is part of the final manufacturing process. It is credited Courtesy of Nike.